Nest Maker questions and answers. Q&A->How to change Scrap to Rest for rest plates. Q&A->How to change material density. Q&A->Selection group of parts with shift button. Q&A->Variables available in Project.inf file. Q&A->How to create new project. In this part we will try to collect questions and answers from our customers. It is possible to change density form table before any of plates of this type is used in nesting. Please note! In this case all previously nested parts will have previous value of density in reports. To have correct values reports must be re-exported. For new nested parts all information will be corresponded with new value. XML file is used to provide data exchange between Nest Maker and Nupas. The name of XML files without extension. Nest Maker will replace "." symbol in the name variable into unit number. XML file from Nupas must be created before making reports in Nest Maker. XML file from Nest Maker will be created during report generation process. To get more information about XML link to Nupas please read Q&A->Production status to Nupas. It is enough to use the Logistical_key, but it have to have a relation with the real Nupas-Cadmatic Hull part. Assume that the status, Nestname and the other items can send to Nupas as well by using the standard XML import. See current default database names related to nest information below. The logistical field have to be editable, but our standard fields which are related to a field Type can’t be changed by the logistical layout function. In case you like to use these standard field you have to change the db.cfg file present in the ncgdb manually. This by changing the second row with the value 1 or you can make the Field Type empty. Group of parts selected with Shift button will be kept selected until user press Escape button. In addition to usual correction commands, addition correction menu will be available. This is very useful for manual correction of the layout. double Width mm       - Maximum width in mm. double Heihht mm      - Maximum height in mm. double S_Xolp       - Total length of the rapid traverse in m.
double S_Rezk       - Total cutting length in m.
double S_Razm       - Total marking length in m.
double S_Perem      - Total jumpers length for manual cutting in m.
double S_Most       - Total bridges length for manual cutting in m.
Int32  S_Nprob      - Number of punching. Int32  S_Nrazm      - Number of the processing marking lines. Int32  S_Nlabl      - Number of the processing text’s lines. Int32  S_Nsimv      - Number of the symbols in text. Int32  S_Nperem     - Jumpers number. Int32  S_Nmost      - Double number of the bridges. Q&A->Variables available for nest sketch. [X]Gross plate length in mm. [Y]Gross plate width in mm. [x]Length dimensions of the nest in mm. [y]Width dimensions of the nest in mm. [V]Total parts weight in kg. [v]Gross plate weight in kg. [h]Length of bridges cuts in m.
ColorCurve=true|false   //Use color for type of lines detection Inner/Outer contours, marking. PlaneTxtDxf=false       //Output text in DXF in plate plane. Root folder for nesting database contain all projects and orders. To recognize it as a root folder, name must contain substring "nest". Next after root folder is a project. Project contain all building numbers and service folder ProjectSet with necessary project settings. Building numbers contain building units and OrdersSet with order settings. Unit must have a DXFParts folder inside. In general DXFParts folder can contain sub folders for DXF with different thickness. After that all service folders and necessary files will be created and new project will be ready to use. 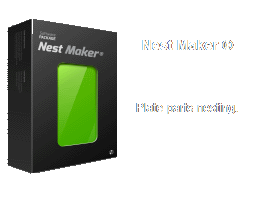 Nest Maker – is 2D graphics editor for plate parts nesting, material orders and rests management, layouts optimization. 1. Import DXF parts into layouts database. 3. Parts text and symbols position optimization. 4. Manual and auto nesting plate parts. 5. Material and rests usage control server. 7. Multi user client – server architecture. 8. Link to NC Maker for CNC programing tools. 1. Nest correctness control field. 2. List of available nests. 3. Current cursor position coordinates. 4. On/Off Parts text visualization. 5. On/Off CNC cutting route visualization. 7. On/Off Show bending direction lines. 8. On/Off Output missing lines (for DXF nests only). 9. On/Off Current nest control. 10. On/Off Current all nests control. 11. List of an open files. Edit window available by press F4 button. This is on of the important part of the Nest maker. Very often DXF plate parts having some problems with text hight and text position. Edit window help to fix most of this problems. User can check part by part from the parts list, edit text position and hight. In most of the cases Nest maker can fix this in auto mode. User need just list of the parts and check is everything is OK. File - contain all necessary commands for open close, merge databases and files. Tools - contain commands for parts editing, material orders, grid setting. Nest - contain commands for creating and editing nests layouts. Rests - rests managements commands. Nested layouts (GSR) – Nest Maker file contains nesting layouts for one thickness and material quality. Nested parts group (NC) – DXF file contains a parts layouts. Parts in DXF - DXF file representation of the plate parts. Parts in DXF – new parts after revision can be added into existing database. Nested layouts in DXF - nests made in different nesting software or CNC programs converted by NC Maker. Nested parts group (GSR) – layouts from another database. Save current open Nested parts group (GSR). Save current open Nested parts group as GSR or DXF. By this command user can change program language. Up to now program support two languages: English and Russian. Cancel of the last Undo command. Commands available in the menu let's user make distance measurement, vertical and horizontal distance as well. Part control command used for comparison parts geometry in database with DXF parts in the folder. Checking progress shown by the checking window. If differences detected Nest Maker will ask to download the new parts into database. Control parts, nest layouts with layouts in GSR for correctness. Recommended after finish complete nest for one unit. Nest Maker will create text report of checking results. The text tables is use to define text for automatically text adjustment. In the following table user can define text relates to inner or outer contours of the part, flange bending lines, part orientation marks and so on. It help to adjust parts texts more correctly. This command lets user change prefix for GSR files. This command lets user change kerf compensation parameter. This command lets user change distance between parts and between part and plate edge. This command lets user set up grid on the gross plate. Grid can be used for exact positioning of the parts. By this command user can manage material usage for one building order. Note: To add new type of material or different plate's size use ADD button. This button will be available only with non zero quantity field. By this command user can manage material usage for current GSR: change plates order for auto nesting, allow program use another material and thickness for nesting. By this command user can check material usage for all order. By this command user rename nests for the unit. This command will generate report for the unit. 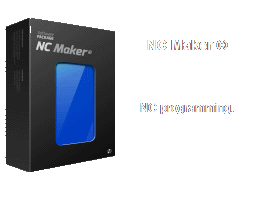 This command will run NC maker for CNC route programming. This is used to start nesting for new plate. Plate dimension will be taken from available gross plates list. To get information about available plates check Tools->Metal for GSR. Nest->Rasters nesting for one plate. This command run rasters auto nesting for one plate. Plate will be taken from list of the available plates. To get information about available plates check Tools->Metal for GSR. Process will stop when no more available parts suitable for nesting. Auto nesting process also can be stopped by user (button Stop in upper left corner of the window). During auto nesting process user can continue to work with the program. Make manual nesting for another plate for example. This command run rasters auto nesting for all available parts and all available plates. Plates will be taken from list of the available plates in according to available lists order. Rests can be also added to the order. To get information about available plates check Tools->Metal for GSR. Process will stop when no more available parts suitable for nesting or no more plates available. Auto nesting process also can be stopped by user (button Stop in upper left corner of the window). During auto nesting process user can continue to work with the program. Make manual nesting for another plate for example. - raster representation of the part. Default value is 10 mm. Auto nesting can be more precise with value for example 5mm, but it will take more time for nesting process. - number of possible parts rotations. To get an optimal position on the nest, parts can be rotated. Default rotation angle 45 deg. it means that parts will have 4 possible rotations. - shift to low left corner. Due to of the raster parts representation distance between parts can be more than specified in the project. This option shift current nested part to left lover corner up to minimal distance between parts. Rest of parameters is used only for compatibility with Omega autonesting. Special rectangle area of the plate for auto nesting. In this case auto nesting will try to find optimal parts position only inside the selected rectangle. Selected area for auto nesting. Sometime if there is a lot of rectangle parts in the nest user can try rectangle nesting. It is very simple, but very fast. All parts represented as rectangles and nested just in according of the dimensions. This function will nest available parts on all available plates from the material list. Nest->Rectangle nesting for one plate. It is similar to Nest->Rectangle nesting, but only for one plate. This command will detect similar nests and remove all replicas. This command allow user to define rectangle rest material from nest layout. Rest dimensions can be inputed from keyboard or by mouse. This command allow user to change dimensions of not registered rest by mouse. This command delete rest form the layout if rest is not registered yet. If rest is registered, this command will cancel rests registration. Cancellation of the registration for used rests is not permitted. This command will download nest layout where selected rest is used. This command will check all layouts and make rests for not used areas bigger than minimal rest dimensions in Rests->Min size. This command will generate Excel table for the available rests. This command will generate Excel table for the available minimal plates. This command is used to shift parts in selected direction as far as possible. Select one of the sub menu item, then select part you want to move. This command help to combine to parts by selected edge. Select edge of the part to move (Edge will be marker by red color ). Then select edge you want to combine. Note! Begin point of the selected edge will corresponding to begin point of the combined edge. Pack command will try to fit selected part in selected direction by shifting and rotation at the same time. Copy command is used for copy of the nested parts. Remove command is used for deleting part from nest. It is not mean the part will be deleted from data base. Deleted part will return to the not nested parts list. Combine parts by common edge. The parts will have common edge for cutting both edges at the same time. Combine# similar to combine, but combined parts will be joined into block and will be selected and moved together. Split selected block into separate parts. As result of this command program will zoom into area where is collision between parts happen. This command show parts list window. On/Off All lists - show all parts in GSR or only not nested parts. Sorting of the parts type: - different variants of the part's list sorting for the auto nesting. List of the available layouts - switch between available layouts. On/Off Show - highlight current selected part position on the layout. - in the middle of the layout - suitable for big plates like shell plates, if it's only one part for the layout. - rectangle nesting - simple, but very quick algorithm for rectangular parts. - autonesting Omega - using auto nesting omega for find part position. - raster autonesting - using raster auto nesting for find part position. On/Off Selfcorrecting - correcting part position after manual placing. Addition parameters shown radius, and number of possible rotations for part. On/Off Shift - shift the part to low left position after autonesting. This command show materials list window available for the current GSR. Materials list window is a main tool for material management. Auto nesting algorithm start to use plates dimensions from first record in the list. If no more available plates it's comes to the second string and so on. On/Off Fractional - use %of the gross plate. On/Off Rests - use available rests. To Order - open material window list for order Tools->Metal for order. This command will redraw all layout's windows in the same scale. This option quite useful if you need to find some space for the part from one of the layouts. Nest Maker release and development history. 08.04.16 Extented nesting commands added. 08.12.15 Nupas style beveling information import added. 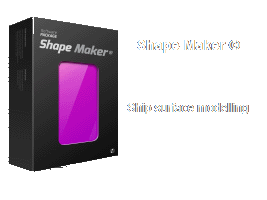 06.03.15 Testing parts import from NX Siemens structure modeling software. 18.10.14 Parts nesting interface improved. 20.06.14 XLS book generation for unit. 28.04.14 Nest Maker new release now available. 20.03.14 User settings synchronization for project. 05.02.14 Nupas DXF parts import improved. 25.02.14 I&V Bevels recognizing during DXF parts import. 20.01.14 Export nests numbers into Nupas. 21.11.13 Link to Nupas-Cadmatic database via XML interface. 09.09.13 New menu and improved functionality for manual nesting parts. 13.08.13 Group of parts for manual nesting implemented. 23.07.13 Auto nesting in selected areas. 11.05.13 New auto nesting algorithm implemented. 28.03.13 Nest Maker new release now available. 19.02.13 Export reports to EXCEL implemented. 15.02.13 Parts text auto adjustment. 11.02.13 Common material usage and rest system support for project. Nest Maker / NC Maker presentation.